In my talks with Australian politicians, leaders, policymakers, academics and NGOs, one thing is clear: Indonesia is strategically and economically important for Australia. However, not much has been said about the importance of Australia for Indonesia. Well, let me say this: Australia is an important international partner for Indonesia. A strong Australia–Indonesia partnership contributes to the growth and security of our region. However, the relationship has been too unstable in recent years. It was good for the media, I’m sure that their ratings went through the roof for their coverage of the beef, spying, execution and boats issues. But it was bad for the overall relationship. Frequent shocks, falls and freezing of cooperation are disruptive at best and endanger our respective security interests at worst. Unpredictable relationship makes it much more difficult for these two emerging powers in their own rights, to act in real partnership to contribute to the region’s economic growth and security. Over the years, both Indonesia and Australia have been responsible global citizens. We’ve worked together with our regional partners to build frameworks for cooperation that actually work, achieve their intended objectives and even serve as models for other regions. Our collaborative experiences show that when we act as a team we can achieve more than we could on our own. That alone gives us a strong incentive to invest in our relationship in a way that increases its value and reduces its instability. Persistently forging small but frequent, deep and broad links might go a long way toward that goal to make the relationship more resilient. First, we should work to grow and expand our military relationship. It’s admirable to have good and consistent links between our military through joint naval, military and air exercises. However, to truly deepen that link, we need to think hard about ways to connect and open ways for our defence industry to collaborate and grow their capabilities and technologies. Thales and Pindad are making inroads in producing tactical vehicles with secure electronic communication combat systems, for instance. And there are many more opportunities for collaboration as Indonesia’s defence industry expands into producing more advanced naval ships, aircraft and weapons. Another point I would like to make is that we shouldn’t let the darkest periods in the relationship define our future relationship. We should move on and build up our partnership based on Indonesia’s and Australia’s many common values of democracy, open economy and internationalism. Second, we should together prepare to engage in a region defined by the growing importance of the major economies of the Indo–Pacific. For the medium-term we should together prepare for the changes brought about by leadership styles, domestic political pressures and shifting coalitions that are unfolding in our region. We’re already seeing it unfold in ASEAN for example, as well as in the bilateral relationship among members of the East Asian Summit. Agreements in ASEAN are harder to come by. Adventures in the South China Sea are becoming bolder. There are instances of some laid-back attitudes to international laws. If left unchecked, there’s a real danger that the regional framework and international law such as the UNCLOS, that Professor Hasjim Djalal for example has helped to shape, may lose its potency. There is a real need more than ever for Australia and Indonesia to collaborate even closer together in the region to help provide solutions at the source of the problems and prevent them from spilling into our respective borders. And third, Australia and Indonesia should direct our engagements in the Indian Ocean, through IORA and with other emerging economies, through MIKTA, to build a common understanding of an international code of behaviour and the commitment to peaceful settlement of disputes consistent with the principles of international law. Building those links bilaterally and with other countries in the region becomes much more urgent and important when we look at it from a broader perspective. A case in point is when we view our relationship from the standpoint of the fast-changing political dynamics and shifting alliances of the region; pressures from increased demands for food, energy, water and other finite resources; and the chronic border tensions in our region. Another perspective is to view our relationship in the context of the seismic changes in the political orientation of a number of decision makers around the world. Some openly deny the existence of climate change, question the value of international trade and doubt the real causes of migration. Those changes might make it more elusive to achieve the greenhouse gas emission cuts target agreed in Paris last year and more difficult to further open the economies of the region for international trade and investment. A case in point is the immediate future of the TPP. And they might make it more difficult for genuine refugees to be protected and resettled. We have a genuine chance to invest in a strong and resilient Indonesia–Australia partnership. That kind of relationship would provide a solid anchor for the Indo–Pacific region and prepare us for an uncertain future that may be full of strategic challenges and opportunities. Nadjib Riphat Kesoema is the Indonesian Ambassador to Australia. 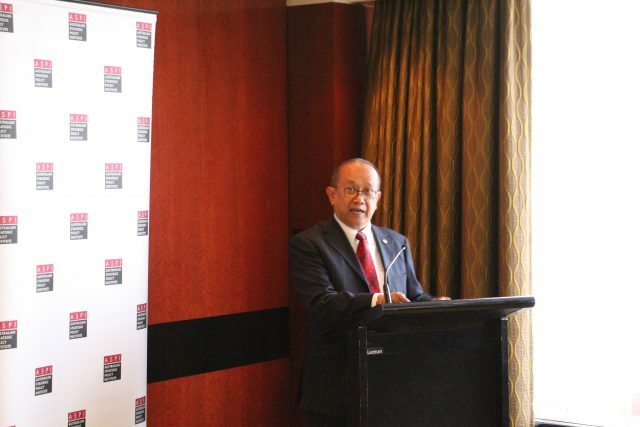 This is an edited version of a speech delivered at the ASPI-FPCI Indonesia–Australia ‘Lombok’ Dialogue, held 28–29 November. Image courtesy of ASPI 2016.